1 Million for Work Flexibility has more than 100 organizations on board to date as part of our coalition—and counting. We’re pleased to share more information about our supporter Sodexo in this Q&A. When a company boldly states that improving quality of life is its core mission, it may be tempting to think that the business has bitten off more than it can chew. After all, meeting that lofty obligation for clients, employees, and the people the organization serves would seem to be a nearly impossible task. Founded in 1966 by Pierre Bellon, Sodexo has grown into the 19th largest employer in the world, with 425,000 workers around the globe who serve 75 million consumers per day in 80 countries. As the company’s founder intended, Sodexo remains committed to improving the quality of life of everyone it serves while contributing to the economic, social, and environmental development of the communities, regions, and countries in which it operates. It accomplishes this by providing everything from sustainable energy programs and efficiently designed workspaces to wellness and nutrition services, using a global business model to gain efficiencies through the sharing of expertise and best practices. This has helped Sodexo make a name for itself as the employer of choice for top talent, and a commitment to flexibility helps the company maintain that status. Executives set the example, showing by their words and deeds that the company will be creative in how work gets done. As Sodexo helps employees balance work and life, they are happier and more loyal, and the company is better able to adapt, grow, and succeed. 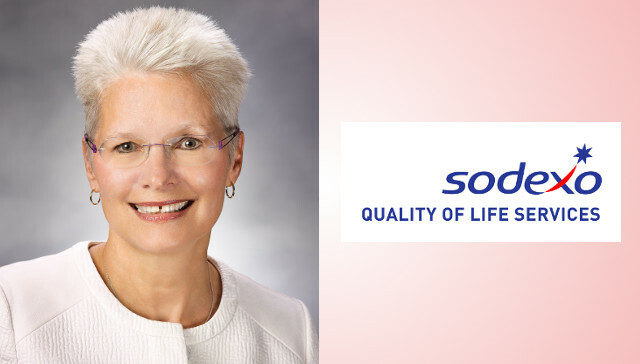 In this Q&A, Lorna C. Donatone, CEO Sodexo Geographic Regions and Region Chair-North America, talks about Sodexo’s five decades of success and the role flexibility will continue to play in the company’s future. 1MFWF: Sodexo celebrates its 50th anniversary this year. What are the most important factors in the company’s longevity and success? Sodexo: Foundational to Sodexo’s core mission of Quality of Life, we conduct business with the highest levels of integrity and uncompromising legal and ethical standards. 1MFWF: What kinds of flexible work options does Sodexo offer its 425,000 employees worldwide? How have the company’s flexibility policies changed over time? Sodexo: Sodexo in the U.S. launched our “Flexibility Works!” initiative in 2008, offering “business-based” flexible options. That includes Formal Flexible Work Arrangements such as telework—telecommuting and remote work, flextime, or reduced schedules—part-time work, and job sharing, as well as informal flexibility for the occasional need. In 2010, the “Sodexo Women’s International Forum for Talent,” or SWIFt, began its effort to expand flexible options as a means to enhance gender balance globally. This year, with the full support of senior leadership, we launched a Global Flexibility Task Force whose charter is to further advance a flexible culture to enhance Quality of Life for employees worldwide. 1MFWF: What do your employees say about how flexibility impacts their performance, and what trends have you seen in recruitment and retention related to flexibility? Sodexo: In early 2016, we conducted a survey with U.S.-based managers. Out of the 2,100 respondents, 72% felt empowered to request the flexibility they needed, 72% claimed they had greater job satisfaction, 62% were more loyal and more likely to stay, 56% had higher employee engagement, and 53% were more productive based on the flexibility they enjoyed. In addition, in the U.S., we have seen an increase of 8 percentage points on the semi-annual employee engagement survey’s work-life balance question. This can be attributed, at least in part, to our increased focus on flexibility, in particular ensuring its relevance not only for those in staff roles, but also in operations. 1MFWF: How has Sodexo’s example of offering flexibility affected its clients and partners? Sodexo: Clients wish to partner with Sodexo given how our values align and enhance the stability for their on-site team. Our clients experience common challenges in attracting, engaging, and retaining top talent, and often times benchmark with Sodexo to gain insights that will help them foster a more diverse and inclusive culture. At the end of the day, our clients are seeking transparent communications and confidence that we are delivering on our promises for positive business outcomes and service levels. 1MFWF: As a leader in this area, do company executives feel they have a responsibility to advocate for flexible work options in the broader business community, and how do they do so? Sodexo: I believe Sodexo has a responsibility to advocate for flexible work culture to fulfill our quality of life mission for our clients, customers, and our workforce. Given that we are business partners with our clients, we have the opportunity to share best practices. In addition, we have strong community relations with numerous organizations, and our presence within these groups enables sharing as well. 1MFWF: Sodexo continues to see great success in the marketplace. What are you doing to position the company for continued expansion in the years to come? How will the company’s commitment to flexibility help it achieve those goals? Sodexo: Sodexo will continue to enhance our clients’ performance through our global footprint, thought leadership, and innovations. In addition, we will stay true to our global “Better Tomorrow 2025” roadmap with a focus on diversity, sustainability, and wellness, along with our commitment to corporate and social responsibility. Ultimately, we will be recognized worldwide as the leader in improving quality of life for our clients, consumers, and employees. Being agile and flexible demonstrates Sodexo is a modern and evolving organization that meets the unique needs and expectations of employees. Fostering an inclusive culture expands the diversity in the talent pool and encourages employees to fully engage and contribute. This will be especially important for incoming generations who are more readily prioritizing work-life integration and purpose-filled work as they make their career decisions.